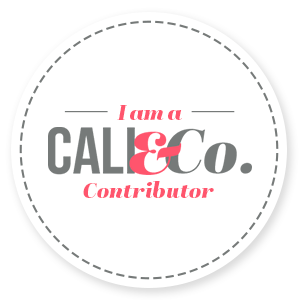 I have been slacking in blogging the last week for a couple of reasons. First, I need to re-shoot the pictures for my pattern hack tutorial. I am not happy with the way they turned out and have an idea to improve them. Second, I thought I had blogged all the tops I had made so far this year. Turns out I am wrong on the second point. I have this and one other top photographed and I forgot all about them. Oh my, what am I going to do with myself? This is another top that made me stop working on my PR Wardrobe Collection. I used Simplicity 8016 in view D. The only major change I made was to eliminate the lace cuffs on the sleeves. I like the 3/4 of the sleeve with out it best. Instead of using the cuff to finish the hem, I just turned and stitched the hem at a 1/2″. I also finished out my lace neckline by adding a taffeta bias strip finish. It is one of my favorite finishing techniques that I would love to write a tutorial on. It give such a clean and easy finished look. The pattern runs from XXS-XXL. According to their size chart I would fit into an XL, and based on the finished measurements that is what I made. This pattern fits pretty true to size in that respect. It has just enough ease in the bust to fit comfortably while flaring out perfectly through the waist. That flare from the bust down is very flattering. It is especially helpful in hiding the tummy lumps and bumps. I was looking on Fabric Mart’s website for lace to use for my version of McCall’s 7095, when I stumbled across this lace. 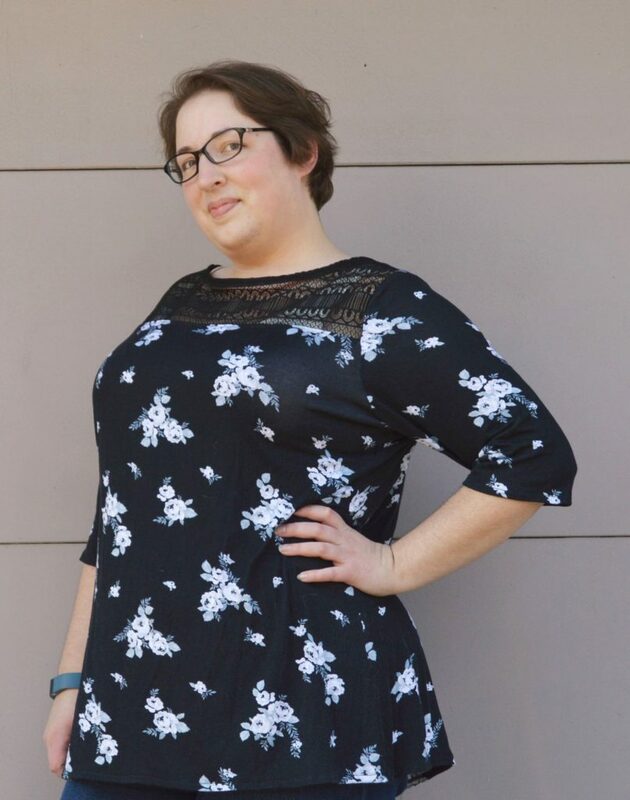 I knew I had to have it and that it would be perfect for Simplicity 8016. I bought 1 yard and ended up only using 1/4 of a yard for the yoke of this top. I foresee more black lace yoke tops and dresses in my future! 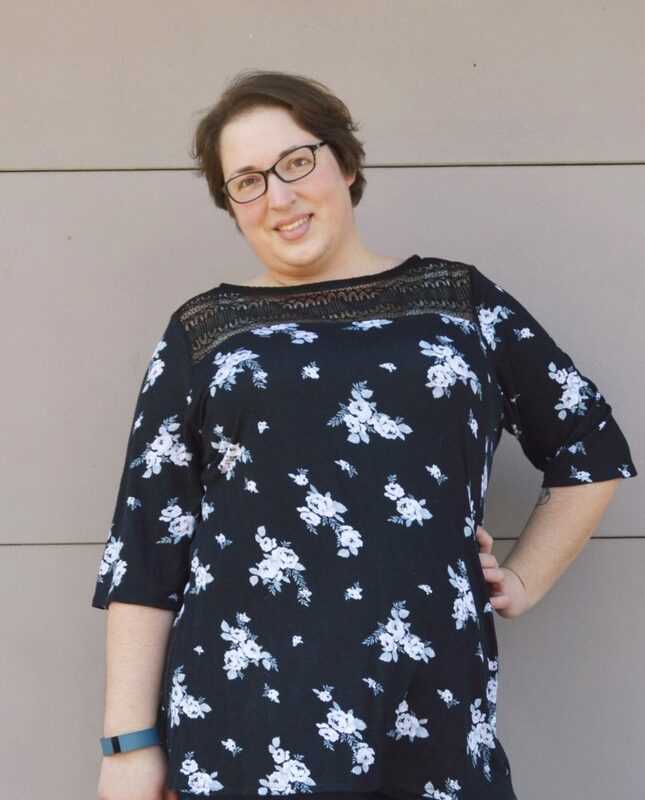 I also used 1.25 yards of black floral rayon jersey from Girl Charlee for the body and sleeves of the top and a black taffeta bias strip for the neckline. The jersey was one of the fabrics in my Knitfix way back in August of last year. I am pretty pleased with the total fabric cost for this top. At a total of $9.44, who wouldn’t be happy?! My only issue with the top is that the black rayon jersey faded so badly after the second wash that it now appears grey instead of black. 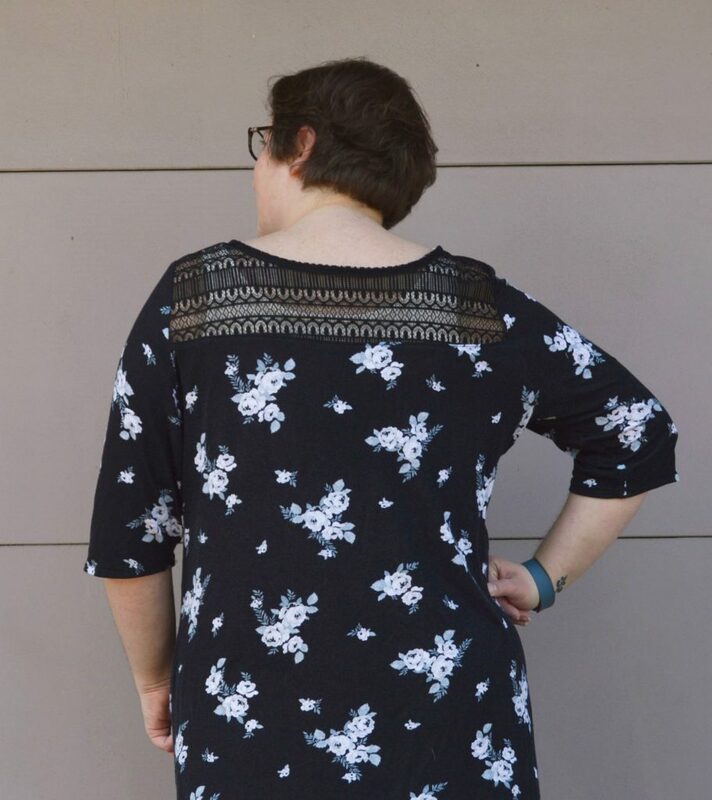 Rayon jersey is so soft and feels like wearing secret pajamas, so it is definitely a disappointment that it did not wash well, but that has absolutely nothing to do with the pattern. I really like the contrast yoke. It is drafted at a great spot to make it flattering on a large variety of body types. I like the back yoke as well. I can see a lot of possibilities for color-blocking this top in the future. This pattern is very easy to put together and as such would be great for beginners. I know I want to make some more versions of this for fall as well as try the other views. Next time I made add a little more length to make this more of a tunic that I can wear with my super skinny jeans. I also want to take the sleeve in just a bit as it is a little too big on me. I just got a couple of new pairs of shorts and I would like to make the tank top view of the yoke top to go with them. And then we have this gem! I do not know what is happening here, but it was too funny not to share. 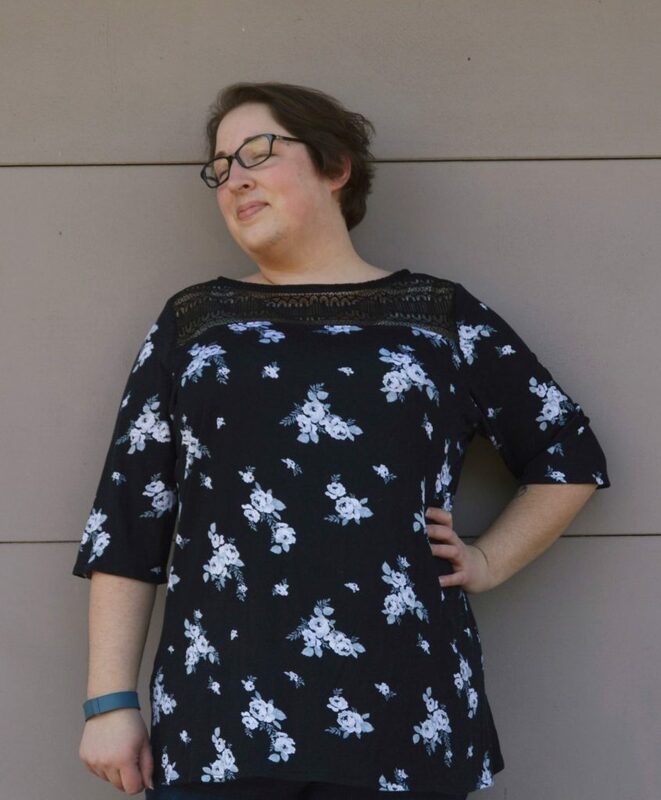 Have you made Simplicity 8016 yet? What did you think? 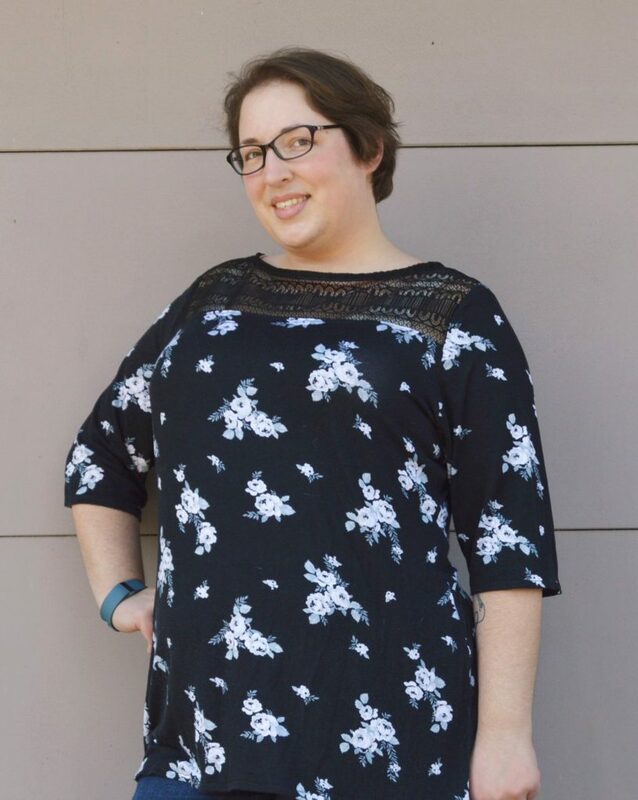 This entry was posted in Sewing and tagged Fabric Mart Fabrics, Girl Charlee, rayon jersey, simplicity 8016. Bookmark the permalink. That lace is a fabulous touch. It looks great! Nice one!. I really like the lace. I’m interested in learning about your taffeta binding. I don’t think I’ve ever sewn with taffeta.